It’s anything that gets in the way of anything less than a stellar customer experience. Brick-and-mortar retail operations can’t afford to have any degree of friction come between them and their customers in this day and age. There are simply too many competitors vying for the same sales, whether that competition is located down the street or somewhere on the internet. Customer service can be the difference between success and failure. 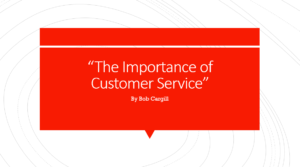 Poor customer service is not only bad for business, it can put you OUT of business. The best products, the best prices, the best marketing, the best advertising…can’t overcome an abundance of friction.